Latitude offers carbon offsets!! (Carbon offsets control the level of fuel emissions that contribute to the greenhouse effect. Make a difference with Latitude)! 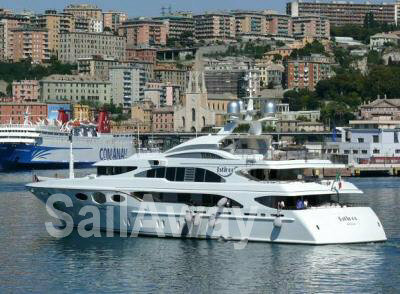 Motor yacht LATITUDE was designed by Stefano Natucci and built by famous Italian shipyard, Benetti. 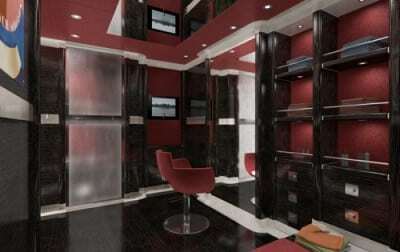 She offers the finest in engineering and interior design. 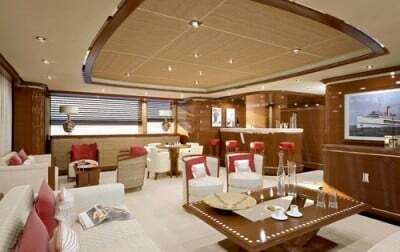 The elegant interior décor of luxury charter yacht Benetti LATITUDE, the provençal word for elegance and harmony, is the result of the collaboration between the shipyard, and the French owners of the superyacht. It was the goal of all parties to reproduce the typical atmosphere of the nineteen-thirties, completely art deco in appearance, but well-combined with modern amenities. 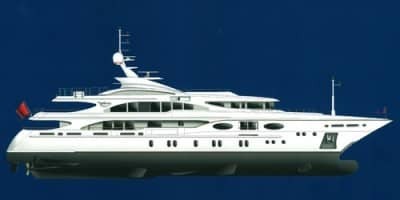 Tons of steel and aluminum, and miles of cables and piping have gone into the construction of this superyacht, one of the largest luxury motor yacht charter vessels ever launched by this builder. 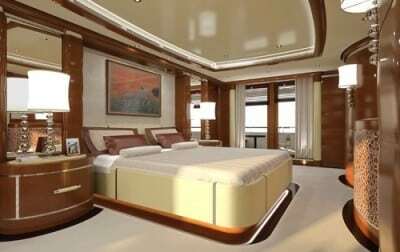 Add to these 3,600 meters of cherry wood paneling, marble and crystal, plus 100 meters of fine fabrics and high quality leather and a masterpiece is created. 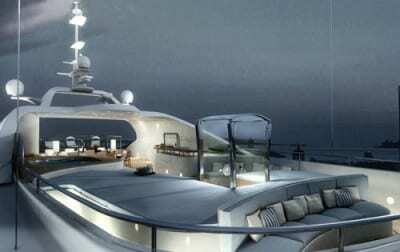 The yacht has been designed specifically for enthusiasts of a Benetti yacht charter. 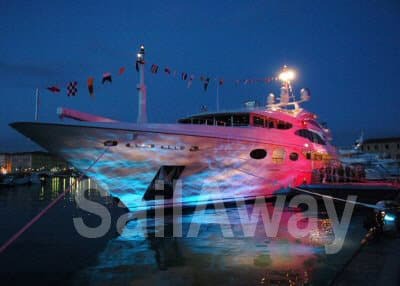 She has a strong showing of interest from clients seeking Mediterranean yacht charter and Caribbean yacht charter vacations. 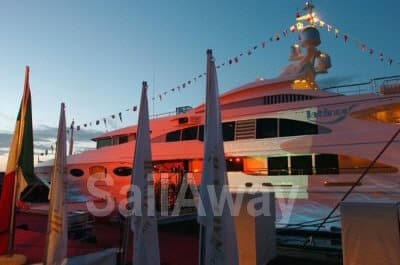 She has a well-equipped kitchen on the main deck, rich bathrooms, shining engine rooms, and a spacious garage with the capacity for two tenders and jet skis. On the under lower deck, there is a wine cellar and a laundry and baggage room. But it is in the main saloon where the magical mood is most noticeable. There are intimate conversation corners and convivial spaces penetrated by gold shafts of light coming from an unexpected skylight. Another surprise feature is a futuristic elevator from which a ray of light permeates the vessel’s five decks. While art deco in its various guises is virtually de rigueur for a yacht interior these days, interior designer Mauro Izzo managed to bring to it his own personal signature and a fresh outlook. Guided by the owners, Izzo spent several months researching art deco styles before settling on a more modernist interpretation. Two interior features in particular recall both the elegance and the size of the old steam liners. 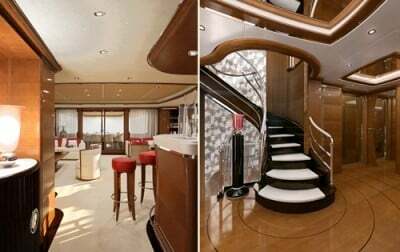 The main staircase, which is lined with engraved mirrors and encircles an elevator connecting the tank level with the sun deck, would not look out of place aboard a much larger yacht. 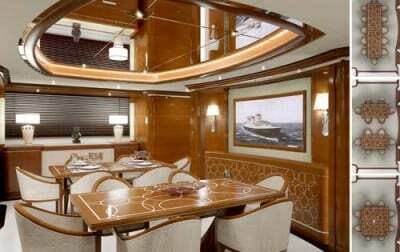 And the wheelhouse is based on the functional layout common to commercial ships, with a walkway in front of the helm and instrument console. Bespoke table lamps and sconces were enlarged to give a feeling of grandeur, while bold concave and convex forms in the cherry paneling and cabinetry add an air of solidity to these areas. 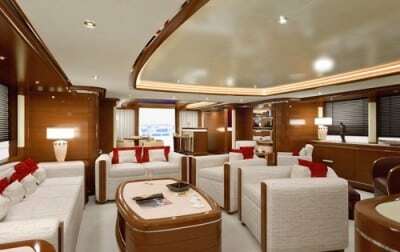 A second saloon sits on the upper deck with a playing table, conversation area, and bar. A sliding door to the outside cleverly allows the interior and exterior areas to blend into one. 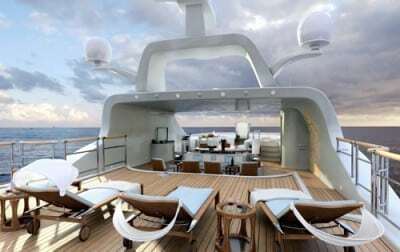 The owner’s suite on the main deck incorporates the finest in technology, style, and creativity with a balcony and panoramic view of the ocean. This super yacht joins several other newer model megayachts in the 1-800 Yacht Charters Superyacht Charter fleet from the same builder, most notably, PLATINUM, ST. DAVID, GALAXY, ANDREAS L, JO, QUEST R, and FELIDAN.